Two of my favorite things: fur and the color black. I've had this H&M faux fur vest for ages and ages, but I've never actually worn it. It actually still has the tags on it. I guess I have been searching for the right way to wear it, and finally I decided that it needed to be paired with all black. I think it's really cool how the sun hits it too, giving it a slight shine. Of course, an all black outfit wouldn't be complete without some pop of color, so adding some simple red accessories was the perfect statement. I think there's a real elegance to wearing all black, but it has to be done properly. Of course, you don't want to look scary, but if done well, it can be really great. I think the trick is in the accessories! Anyways, today is my very last day of classes in Paris, which is such a relief but also a reminder that my time here is very limited. I'm so looking forward to summer in California but I don't want to say goodbye to my Parisian family! Tons of work to do, more tomorrow. See you on Facebook and Twitter until then. Magnifique, j'aime trop comment tu es habillé ! i just started blogging and my blog is quite new, it would mean a lot to me if you would check it out :) thanks so much! 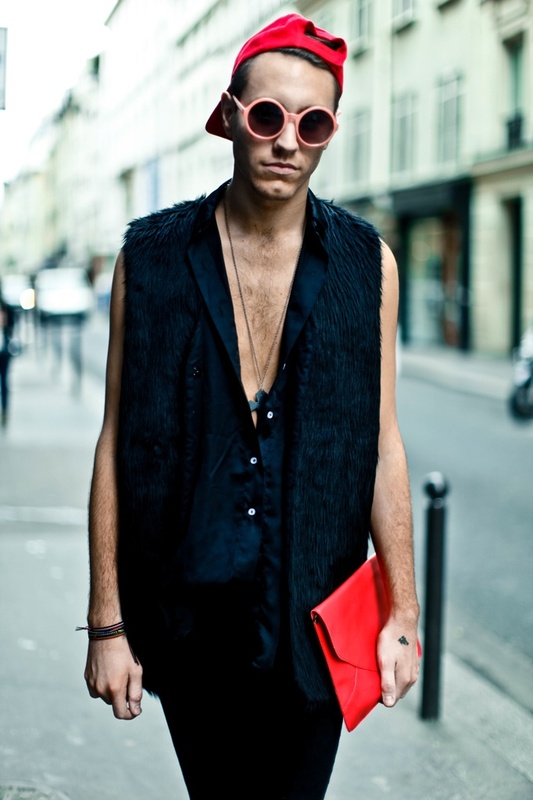 Love the clutch and the vest! That faux fur vest rocks big time!!! Especially your pink sunnies tooo!!!! Ton blog c'est fantastique. J'adore! !